Will you be attending CiscoLive 2018 this year? 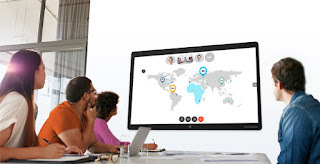 If so, why not learn more about our exciting Cisco Collaboration Analytics for UCM, HCS, Jabber and now Webex! Communication has rapidly evolved from desk-tied audio connection to participants huddling in virtual groups or teams empowered through voice, video, and chat. Participants can contribute ideas, deliver presentations, engage colleagues, and build direction by sharing files, white boarding and screen share. Team collaboration solutions such as Cisco Webex Teams, Microsoft Teams, RingCentral Glip, Slack and many others are forcing managers to think beyond the enterprise. These solutions address the realities of today’s digital transformation. People are demanding more from their communication ecosystem. Agile workers need to access information anywhere, anytime in secure but flexible work spaces from any device. Most organizations can now consolidate existing communication tools into a single platform deployed across the entire enterprise. Come visit Resource Software International Ltd. (RSI) in the Cisco Collaboration Village (booth C5). You want to schedule a personal demo at CiscoLive or via Webex? Contact sales@telecost.com! OSHAWA, ONTARIO – May 2, 2018 – Resource Software International Ltd. (RSI), a world leader in producing products, training and resources that proactively utilize communication analytics to create a more dynamic, responsive and productive communication ecosystem; officially joined the ConvergeOne Preferred Partner Program as a bronze member. ConvergeOne (NASDAQ: CVON) is a leading global IT service provider of collaboration and technology solutions for large and medium enterprise with decades of experience assisting customers to transform their digital infrastructure and realize a return on investment. The agreement will facilitate the distribution of RSI communication management solutions through the ConvergeOne extensive network. By teaming with a national brand like ConvergeOne—which services over 7200 enterprises—RSI can effectively offer its scalable communication management portfolio around the globe. The RSI communication management portfolio, for premise and cloud implementations, offers actionable business intelligence for voice, video, chat, collaboration spaces and call centers. The software, Shadow CMS All-In-One Analytics, allows communication managers to monitor, measure and manage communication activity form any number of endpoints (including telephones, messaging, collaboration teams/spaces, video, hunt groups, agents or subscribers). Major components include call accounting, call center reporting, real time dashboards, call recording playback, collaboration spaces adoption and emergency notification. RSI products are independently tested and verified to work with most major industry providers including Avaya, Cisco, Microsoft and RingCentral. The ConvergeOne Partner Program is designed to identify top technology partners, nurture long-term relationships, and promote partner solutions with customers. Companies such as Resource Software International Ltd. (RSI) can qualify for one of three tiers of partnership (Elite, Preferred, Select) based on criteria including national presence and regional support, ease of doing business, revenue, lead generation, parts support, technical training, and customer service. Founded in 1990, Resource Software International Ltd. is a developer, manufacturer and distributor of communication management solutions. The company offers a wide range of products including: call accounting, collaboration spaces metrics, real time dashboards, contact center reporting, emergency notification and custom AI/Bot/CRM integrations in over 80 countries around the world. The success of every business is directly related to their ability to communicate from anywhere. Efficient collaboration is the essential ingredient in allowing colleagues to share ideas, build consensus, establish direction and get things done. More than ever before, managers are faced with selecting between a vast array of communication tools. The selection process may be complex but what happens when a chosen solution is deployed is even more daunting. Migrating from traditional premise based PBX solutions to all-encompassing cloud-based team collaboration requires a general shift in workplace culture, buy-in from all stakeholders and maximum adoption. People need to leave old ways of doing things behind. Traditional call accounting systems largely focus on premise based PBX systems with central focus on voice traffic activity. The evolution of team collaboration requires more sophisticated analysis of various communication channels and participant behavior. Team collaboration analytics is needed to make sure selected tools are being adopted, reduce decision times and improve collaboration. RSI’s Shadow Spaces for Team Collaboration offers insights to managers about user adoption, project progression, calls, meetings, bot activity, file uploads, activity/inactivity of spaces and trending topics. This allows managers to increase adoption, accelerate their digital transformation and maintain a healthy collaboration ecosystem ensuring maximum ROI. The old adage still rings true – you cannot manage what you cannot measure. RSI is recognized globally for creating solutions that help you proactively measure, monitor and manage your communication ecosystem. Our mission has never strayed from giving organizations an upper hand on empowering productivity through seamless collaboration management. Managers no longer need to be tied to their desks to act, react and enact communication solutions based on concrete real time quantitative information. Founded in 1990, RSI is a world leader in producing products, training and resources that manage, control and reduce the expense of communication facilities resulting in a more dynamic, responsive and productive communication ecosystem. RSI offers communication management solutions for premise, hybrid and cloud environments that empower enterprises to increase adoption of new technologies, remove bottlenecks, reconcile expenses and improve customer experience. Core solutions include call accounting, call center reporting, team collaboration analytics, real time dashboards, and emergency notification. The company also offers professional services for building custom AI/Bots and CRM integrations that connect technologies together.